A mod-loader is simply a utility that is designed to do just that: load mods. They serve as technical foundations in the background of installations for an assortment of mods which introduce actual gameplay or aesthetic changes. Mod-loaders also enable mods which utilize them to be compatible with each other. There are a few different mod-loaders, however most mods use either Forge or Liteloader. Given that it is so essential, in this article I will show you how to install Forge and in the next, Liteloader. 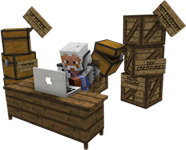 In the last article of the series we covered the Minecraft 1.11.2 Launcher and profiles. Now it’s time to talk about Java. The problem with the launcher is that it comes bundled with a two-year-old, 32-bit version of Java that can cause all sorts of weirdness and problems! The biggest of these is that it probably doesn’t use as much of your computer’s RAM as possible, so even though you can run Minecraft decently, it doesn’t always work as efficiently and smoothly as it could. In addition, a number of mods only list the latest Java version as compatible. This article will teach you how to install the correct or updated Java version and enable Minecraft to utilize it. This article is the first in a series on installing popular 1.11.2 Mods approved on Empire Minecraft and related topics such as profiles, the launcher, Java and modloaders. We will first cover profiles as they are the foundation of mod and modloader installations, while the Minecraft launcher is where they are managed. The first thing you will see when you start Minecraft is the launcher, where you can choose a profile and play with it or create and manage all your profiles. A profile contains the settings used by a Minecraft session. such as the version, mods contained within it and Java instructions.